While on Facebook (man it sounds like I’m on Facebook a lot), I came across a post my friend Desiree added to her wall. 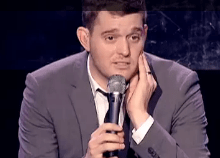 It’s a clip of an audience member asking Michael Buble if her son can sing with him. At first he doesn’t take it seriously… but then he gets a surprise. I was grinning from ear to ear. So happy and proud of that young boy. Wanted to share because I thought you would enjoy it. That was great and such a fantastic reaction from Michael Buble! HAHA oh that was great ! What a great reaction from Michael.